Wedding days should be unforgettable, and wedding photography is something to help with that. There are so many amazing moments starting from the early morning when a well-rested bride starts her morning preparations, to late night when the new family celebrates the beginning of their new life together. Whether you hire Punta Cana photographer or a local professional, gigabytes of good memories can be made if the couple arranges reasonable wedding photographer hours to save every moment. It sounds easy, but what are reasonable hours in this case? Let’s try to find the answer to that question. Many couples try to decide between whole day versus a couple of hours. It is quite a reasonable question as both options have their benefits. Under a tight budget, a part-time photographer can be a good idea. They can be invited to participate only in part of the ceremony instead of staying through the whole event. It is usually much cheaper, so even with limited finances, you can get some amazing professional pictures. This is also a good idea if a couple wants to take it easy and only have several hours of being photographed. For example, the bride might want to change into jeans and keep it casual. That is reason enough. However, having a photographer for longer hours is more typical, even though the cost is much higher. There are a variety of packages that include a different number of hours. The schedule should be arranged in advance. If you want a photographer to have a break in the middle of the day, that should also be discussed in advance. Let’s take a look at the stages of a wedding party so that you can get a better idea about the number of hours required. This is the beginning of the day, and as insignificant as it might look, it is a very important part of the big day. Makeup and hairstyles are being done, the dress and all the accessories are being put on – it is already something to remember. The bride and groom feel worried and excited at the same time. Capturing these moments with the closest people is a blast for both the photographer and the couple. It can take between 1-2 hours as there are a lot of small moments that can be turned into unique pictures. And it’s definitely worth paying attention to. Sometimes, partners see each other for the first time on a wedding day during the ceremony. However, many couples choose to start early. It gives a chance to spend some time in a close family circle before the rest of the guests arrive. Groom seeing his chosen bride in all of her wedding beauty for the first time is very touching. Having it captured is precious. Several portraits in a home setting, first touch before the ceremony, getting ready for the official part – the average time for this part of the day is about one hour. Unless a couple also wants to spend some time in a park or at the beach before moving on to the official part. This is definitely the highlight of every wedding. Two people joining their lives together, what can be more beautiful and touching. Every moment is unique and treasured; the photographer has to be very attentive not to miss anything as there is no way to go back and take a couple more shots. Ideally, the guests should be asked to not use phones with flashes or jump in front of the photographer. It will guarantee that no pictures will be spoiled by random lights and occasionally obscuring of the star couple. Depending on how the pre-ceremony went, this part can be shorter or longer. The average is between 1 and 3 hours. Newly-weds get to the destination of choice, make first steps as a married couple. Everything feels new, parents are happy, guests are excited. Some couples prefer to spend more time photographing on this stage. Even though it can be hard work to pose in front of a camera while being so excited after the ceremony, it is a great time for taking group pictures and having some fun shots with family and friends. It’s nice to come up with some ideas in advance. For example, buying balloons and letting them fly into the sky or renting a horse carriage to add a bit of atmosphere. Depending on the hourly rate of your photographer, you can plan the course of the evening and set all the important moments for the first couple hours. As much as you can afford is good enough. All the stages of the wedding together take about 8-10 hours. Hiring a photographer for all of them can be pricier, though it will guarantee that nothing important will be missed. Again, this day only happens once. You won’t be able to go back and fill in, so it makes sense to at least try making it perfect from the first try. It’s easier to exclude some shots from the wedding album than to deal with the lack of memorable pictures. 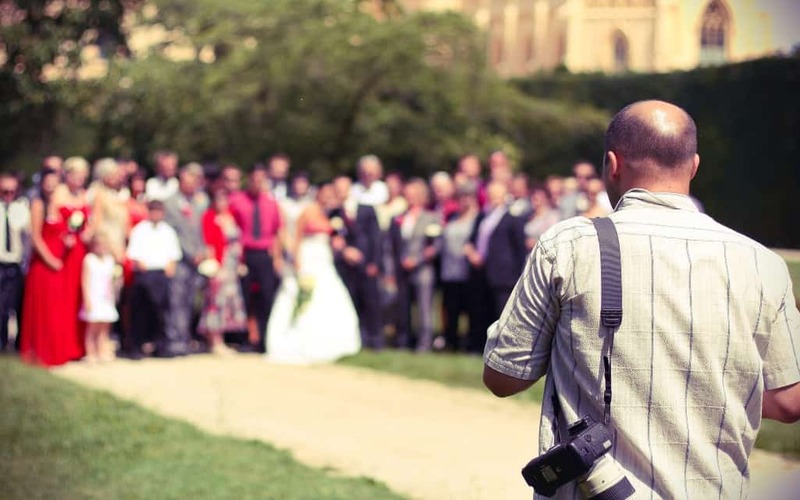 Before making a final decision, check different wedding photographer prices per hour and see what coverage you want. It can be only the preparation and ceremony. However, there are so many amazing moments during the reception, like cake-cutting or first dance, that may be missed. Think about it and make sure you’ll get what you want. To get some inspiration, view our portfolio and try to imagine what exactly you want. Planning everything ahead of time will get you the best experience.